Developing a budget is one of the first and most important tasks in managing an event. 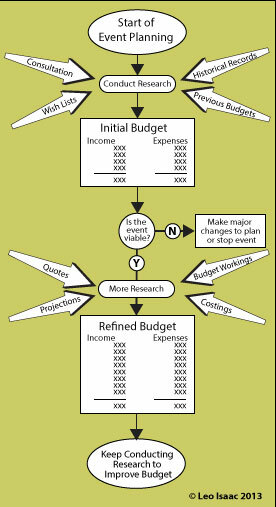 In the initial planning phase, the development of a budget helps to establish whether the event will be viable i.e. whether total revenues will cover total costs. Firm commitments to run an event should not be made until sufficient budgeting has been undertaken to establish viability. The budgeting process starts immediately when planning an event. It's a case of making a start somehow, anyhow, by getting some rough estimates down on paper. Then day by day, week by week, your task is to refine your rough estimates by seeking information through a number of ways by researching and talking to staff, contractors, and stakeholders. As planning continues, and more information comes to hand, your budget will hopefully become increasingly accurate. Probably a good place to start in the budgeting process is to consider where the money will be coming from to pay for the costs of the event. You will need to consult with anyone who has knowledge of similar events or can assist you to make realistic estimates. Importantly, all sources of income must be estimated realistically. Overestimating income is a sure way to run into financial difficulty. After estimating event income, you will need to identify the costs that the event will incur. Again you will need to consult with people who have experience of similar events, or can help you identify types of expenditures and workout probable costs. There is always the probability that something will be missed if you fail to consult. You will need to obtain accurate costing from potential suppliers. Make some telephone calls! Call the newspaper and gets some quotes on advertising space. Do you need to provide any catering (e.g. finger food and drinks) for the dignitaries and officials for after the opening ceremony? Call some caterers and get some prices. How many trophies do you think will be needed? Call the trophy shop and get some idea of prices. As you obtain quotes, a picture of costs begins to emerge. The more research and consultation, the more accurate your budget will likely be. As you identify income and expenditure, you will be able to create a summary that predicts the financial viability of the event. There is always great temptation to alter the figures if your research efforts indicate a possible loss. An event budget must at least show a break-even situation. But you should resist boosting figures for income or decreasing project event costs.